Justice M. S. Hassan of the Federal High Court Lagos has sentenced former Aviation Minister, Femi Fani-Kayode and Nenadi Esther Usman, a former Minister of Finance and Director of Finance PDP Presidential Campaign Organization to jail. 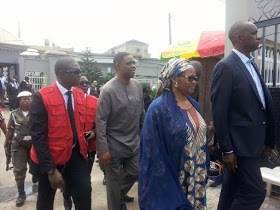 The duo were sent to prison after the Economic and Financial Crimes Commission (EFCC) on Tuesday, June 28, 2016 arraigned them (Nenadi Usman, former Minister of Finance and Director of Finance PDP Presidential Campaign Organization in the last general election and Fani-Kayode also a former Minister and Director Media/Publicity of the PDP Presidential Campaign Organization) along with Danjuma Yusuf and Jointrust Dimensions Nigeria Limited before Justice M. S. Hassan of the Federal High Court Lagos, on a 17-count charge bordering on conspiracy, stealing, corruption and making cash payments exceeding the amount authorized by law. The accused were alleged to have stolen and illegally disbursed about N4.9 billion Naira belonging to the Federal Government of Nigeria for political and personal uses. 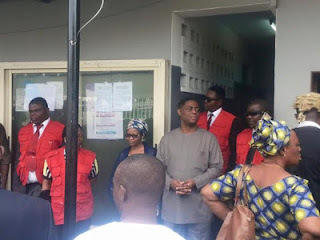 Part of the charge reads: “That you, NENADI ESTHER USMAN, FEMI FANI-KAYODE, DANJUMA YUSUF and JOINTRUST DIMENTIONS NIGERIA LTD on or about the 8th day of January, 2015, within the jurisdiction of this Honourable Court conspired amongst yourselves to indirectly retain the sum of N1,500, 000,000.00 (One Billion, Five Hundred Million Naira) which sum you reasonably ought to have known form part of the proceeds of an unlawful act to wit: stealing, and you thereby committed an offence contrary to Section 18(a) of the Money Laundering (Prohibition) (Amendment) Act, 2012 and punishable under Section 15(3) & 4 of the same Act. ‘That you, NENADI ESTHER USMAN, DANJUMAN YUSUF AND JOINTRUST DIMENTIONS NIGERIA LTD on or about the 9th day of January, 2015, within the jurisdiction of this Honourable Court indirectly retained the sum of N300,000,000.00 (Three Hundred Million Naira ) which sum you reasonably ought to have known form part of the proceeds of an unlawful act to wit: corruption, and you thereby committed an offence contrary to Section 15(2)(d) of the Money Laundering (Prohibition) (Amendment) Act, 2012 and punishable under Section 15(3) & 4 of the same Act”. In view of their plea, prosecuting counsel, Rotimi Oyedepo asked that trial commence immediately and that the case be given accelerated hearing. However, counsel to accused: Fred Orbih (SAN), Ifedayo Adedipe (SAN), and S. I. Ameh (SAN) for first. Second and third accused respectively, informed the court of their applications for bail. But Rotimi said he needed time to respond to the applications and urged the court to remand the defendants in prison custody pending the consideration of the bail applications. Justice Hassan ruled that “since the prosecution was only served bail application yesterday, and in the interest of justice, it will be fair if the prosecution is given the opportunity to respond”.